It’s all downhill from here! (Well not really, but it was for a little while when Opportunity was at the top of that hill!) The image above is a mosaic I assembled from six color-composites, each made from three separate images acquired in near-infrared, green, and near-ultraviolet color wavelengths on April 21, 2017 (mission sol 4707). It’s been adjusted to appear in approximate true color to what the scene might look like to a human standing on Mars. The view shows a ridge called “Rocheport” located on the western rim of Endeavour Crater (the interior of which would be toward the right in this image) which was the final segment of Opportunity’s last target region of exploration, Cape Tribulation. 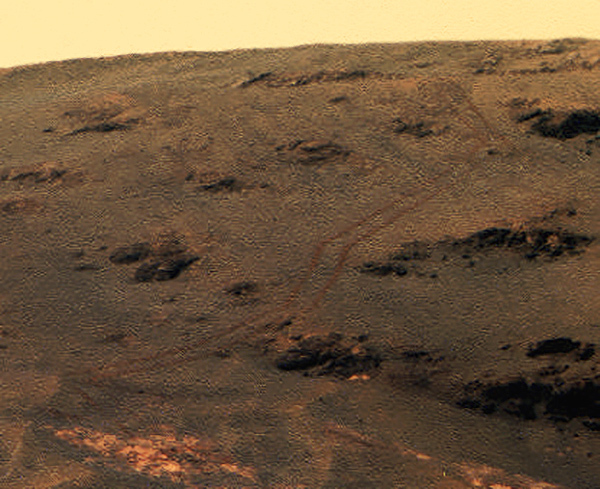 Opportunity’s wheel tracks can be seen at the bottom center, heading back up the ridge and zig-zagging toward the top (detail below). Opportunity is currently on its way to its next target area, a valley about a kilometer to the south called Perseverance Valley. Mission scientists are hoping that Opportunity’s drive down into the valley will return evidence of past water erosion. “It’s what you would do if you were an astronaut arriving at a feature like this: Start at the top, looking at the source material, then proceed down the valley, looking at deposits along the way and at the bottom,” said Opportunity Deputy Principal Investigator Ray Arvidson, of Washington University in St. Louis. Now in its 14th year on Mars, Opportunity is still running well and exploring away, looking for evidence of ancient water environments in the Meridiani Planum region. Since its landing on Jan. 25, 2004, the solar-powered rover has traveled 27.6 miles (44.4 km) on Mars. I’m just glad to be able to see the pictures still coming in, giving us nearly daily views from the surface of another world! Read an update on Opportunity’s mission and plans for the future here. Great article and update on “Opportunity” Jason! It’s amazing how it’s exceeded it’s lifespan over 50 times! Thank you for keeping us current on the “Latest” space-related news!